When we learned about the Diversity Empowerment Summit happening at the Linux Foundation’s annual Open Source Summit North America this year, we knew R-Ladies needed to be there. R-Ladies is an indirect Linux Foundation project, funded through a grant from the R Consortium. Open Source Summit, originally launched in 2009 as LinuxCon, is a series of conferences held throughout the world and a hub of open source community activity. Many open source communities that the Linux Foundation supports, including KVM and the Linux Kernel, often coordinate their own community meetings around this time as part of the Summit. Although we missed the deadline for submissions, John Mertic, our Linux Foundation coordinator through the R Consortium and a staunch supporter of R-Ladies, championed our request to participate. The event organizers welcomed our participation with both a table and an evening Birds of a Feather (BoF) session, and invited us to be a community partner with our logo on the event page. We, of course, hadn’t asked for nearly so much and felt truly grateful (and valued) for the opportunity to participate alongside other open source community members. R-Ladies was initially founded in 2012 by Gabriela de Queiroz in San Francisco. The subsequent explosion of new chapters showed how much R-Ladies was needed, and a centralized organizational model had to be established to sustain it. In 2016, the R Consortium awarded R-Ladies a grant to establish a worldwide network of chapters. At that time, we hoped to expand to 5-10 cities over the following year. We surpassed it, with 20 new chapters forming in 2016 and currently have over 120 chapters worldwide! Our 3-year plan was approved by the R Consortium in 2018, and R Ladies was recognized as a top level R Consortium project. R-Ladies provides chapter organizers with new chapter kits and uses Meetup.com, Slack, and Github to manage chapters. 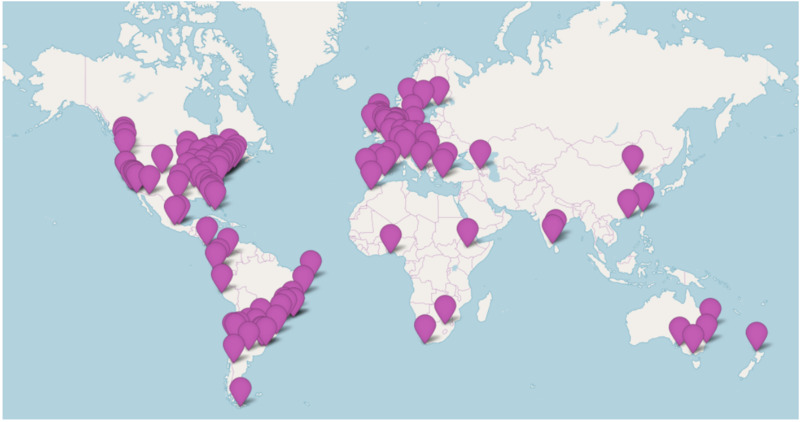 Currently, R-Ladies membership spans the globe with over 30,000 registered members reported on Meetup.com. The exhibit hall was well lit and lined with booths, with a scattering of lounge areas and coffee service. Our table, while not as fancy as those of corporate sponsors, had a lovely layout of R-Ladies themed stickers and buttons. We enlisted the assistance of the local Vancouver and Victoria R-Ladies Chapter. The organizer of the Victoria chapter, Dr. Noushin Nabavi came out to (wo)man the table with us. Noushin uses R in her field of Cellular/Molecular Biology and is completing her Postdoctoral work in Cancer Research. This was her first tech industry conference and she hoped to learn more about the world of software and data science! Many attendees we spoke with from a software engineering background generally had little knowledge of R but a few admitted using it in specific cases. Dawn Foster, who presented her social network analysis of the Linux Kernel community for her PhD thesis, shared that she had used R when statistical analysis packages were not available in her preferred language of Python. The biggest surprise was the number of attendees we spoke with that identified as “non-technical” yet regularly used R or had in the past. They had degrees in psychology, political science, even middle eastern studies, and had previously used R for their quantitative analysis requirements. They currently held “non-technical” roles in marketing and customer service, such as marketing analyst or community manager. They wanted to do better analysis than what their tools limited them to, but felt learning a programming language like Python was a big obstacle. Learning to do these things with an already familiar tool within a supportive community really excited them! Intuitively, we understand that everyone learns differently, yet many of us are subjected to a one-size-fits-all education. If learning is the transfer of knowledge, then this requires us to integrate new information into what we already know and have experienced. Because these things vary across individuals, it follows that the methods we each use for assimilating this new knowledge would vary as well. GenderMag proposes several categories for these different methods of learning and provides tools and guidance for open source software projects to accommodate these different methods in their workflow. So what do these learning styles have to do with gender? Gender is a factor because in their research groups certain learning styles appeared to be highly concentrated among different gender groups. When a software community favors a particular set learning styles or perspectives, individuals who favor other learning styles have to work harder to participate. This extra effort takes mental energy away from technical learning, focusing on harder problems, and overall reward feedback. R-Ladies could potentially use Gendermag for mentoring and to improve tools to encourage knowledge sharing and growth in the R community! The presenter was Anita Sarma, an Associate Professor at Oregon State University whose current research focus is increasing gender inclusivity in open source software. CHAOSS is a young Linux Foundation project that seeks to help open source communities monitor community health through metrics. The focus for the past year has been predominantly quantitative, with the community taking a traditional software engineering development approach where one team develops metrics and the other team implements them. The Diversity and Initiative Working Group is an effort to adapt this workflow as they gain experience in research, analysis, and the challenges of reducing complex human behavior and social structures to mere algorithms. There was an interesting discussion around qualitative research methodology. While members of the panel expressed the importance of qualitative research and common misconceptions they encountered, only Anita Sarma could speak about to the actual qualitative methodology used. In the tech industry, qualitative methods are often interpreted as loosely structured interviews and opinions. Actually, this loose structure is based in rigorous social science methodology that takes years of training. Knowledge and application of mixed research methods is one area that could benefit from a collaboration with a diverse group of subject matter experts like R-Ladies. Not only would it help CHAOSS D&I produce higher quality, effective analysis that makes a difference, but would also connect R-Ladies to the larger open source software community space, improving our own technical skills and giving us a part in larger conversations. Gabriela introduced the R-Ladies community, sharing our history, membership growth, and plans for the future. The majority of our funds are currently used to cover Meetup.com costs. Even with the non-profit pricing Meetup.com offers, R-Ladies pays over $18,000 per year ($1500 per month) to Meetup.com. This amount of money per month could cover a significant portion of refreshment costs or space rental fees for all of our chapters, or even travel costs for R-Ladies attending conferences or visiting other chapters. In fact, these are all things we hope to be able to fund in the future. As our community grows with more chapters and more members, our Meetup.com costs will also grow. We are currently working towards obtaining full non-profit status to help secure financial support for this privately-owned, essential utility, as well as our future efforts to sustain our ever expanding R-Ladies community. Participants in our session were mostly from academia. Anita Sarma, OSU assistant professor who had presented on Gendermag, responded to a member of MXNet that was seeking advice on how to increase diversity in their community. Other discussion topics included how to grow and maintain a community and transitioning from academia to industry. Luz Angélica Caudillo Mata, an applied math and geophysics postdoc at UBC, addressed both of these topics when she shared her experience launching a chapter of Industry Problem-Solving Workshops (IPSW) in Mexico. The IPSW’s facilitate a 5-day problem-solving session between companies and academics. The case-studies presented are very specific and focus on mathematical or statistical content. The academics propose different ideas which often leads to future long-term collaboration. Many of us shared stories about how R-Ladies has helped us, both in our careers and personal lives. For example, one former stay-at-home mom attributed her current position to the emotional and professional support from the R-Ladies community. After our session was over, a few of us continued the conversation at the conference dinner later that evening. R-Ladies isn’t just a professional interest group, it’s an instant family! R-Ladies Vancouver was kind enough to host a social meetup! We met up with our colleague Jason Plurad, who is involved in the Janusgraph community and is incredibly supportive of R-Ladies, and invited him to join us. It was wonderful to meet everyone and learn about how their chapter is going and what they are doing with R! Lisa attended our conference session the evening prior, so it was great to talk to her more about how she’s using R in her neuroscience studies. Raïssa and Anna are an oceanographers working in industry who use R for environmental data analysis. 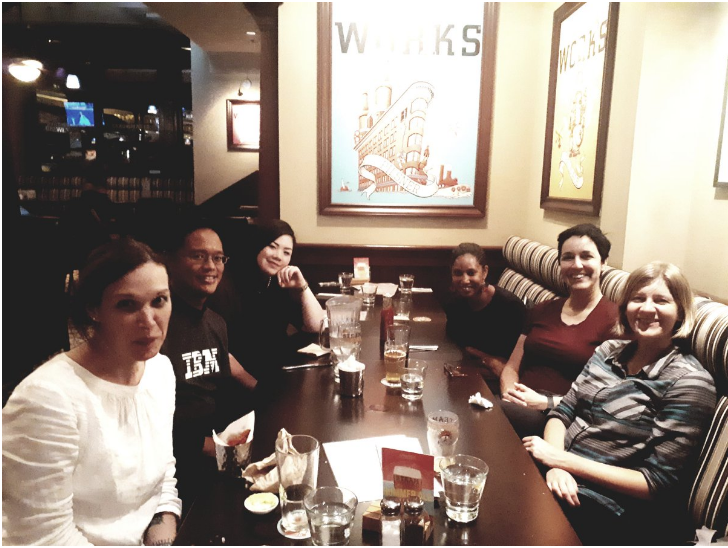 While we mostly talked about R-Ladies Vancouver, the events they are hosting, and success stories, we also talked about a variety of other subjects like how African creole languages led to the development of American Southern English. Overall the evening was the perfect way to wrap up Open Source Summit! Currently in the Data Science community there are efforts to teach software skills for reproducible research. The open source software community could benefit from more research skills and subject matter expertise diversity. By including us in the Open Source Summit, the Linux Foundation gave us a voice in this larger conversation. The R-Ladies community is very much in sync with the spirit of the open source movement and it’s our hope that this common ground will cultivate a cross-pollination of skills, ideas, and opportunities! Encourage potential R-Ladies to join or start a chapter! Offer free meeting space or sponsor refreshments for a local R-Ladies Chapter! Reach out and invite R-Ladies to your meetups!